Bees communicate location information to their hivemates with the famous waggle dance, first decoded by Karl von Frisch in the 1920s. A bee returning to its hive, if it has found flowers, makes a distinctive wiggle of the abdomen and dances up the side of the honeycomb. The bee's angle from the vertical indicates the angle of the flower away from the sun. A dance 100 degrees to the left of the 12 o'clock position indicates flowers can be found 100 degrees to the left of the sun, as seen from the hive. 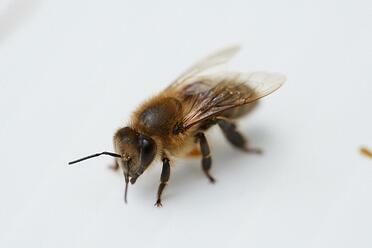 If the food is found by flying away from the sun, the bee dances downward rather than upward. The duration of the dance tells other bees the distance of the pollen source—a fast dance indicates food close by. 1. Bees can indeed hear, "and their ears are well suited for detecting the sounds associated with the dances." 2. "Both sound and dance are needed to communicate information about the location and the food." A bee with clipped wings, which raised the frequency of the sound produced by the dancer, could not recruit other bees. 3. Bees in the audience of the hive may rub their thoraxes against the comb, producing a squeak that vibrates the comb. This causes the dancing bee to stop the dance and dole out samples of food, "so that her audience knows not only the direction and distance to the feeding site but how the food smells and tastes as well." 4. A robot bee, dabbed with a faint floral fragrance and "waggled" by a step motor, successfully guides bees to a sugar solution placed in a distant field. In 1986 it was discovered that bees form detailed cognitive maps. They optimize their routes to flower locations, taking the shortest route when visiting multiple sites. Bees refuse to respond to a waggle dance that points to the middle of a lake. However, they respond to a waggle dance that points to the opposite shore of a lake. Does it sound unrealistic to suggest that pictures and maps could be preserved in the tiny heads of insects? The bee brain is tiny compared to a human brain, but it is nevertheless a complex system with over 200,000 different nerve cells. No wonder they can carry out some complex information processing.